Amazon, the world’s largest online retailer, recently launched the latest addition to their website, namely Amazon Vehicles. This new page is aimed at providing the “automotive community” with a one-stop platform to browse and compare reviews on a plethora of vehicles. From old school 90s station wagons to the latest electric-powered beasts, the sheer magnitude of motor reviews on Vehicles is absolutely staggering. There is even a decent range of motorcycles thrown in for good measure. 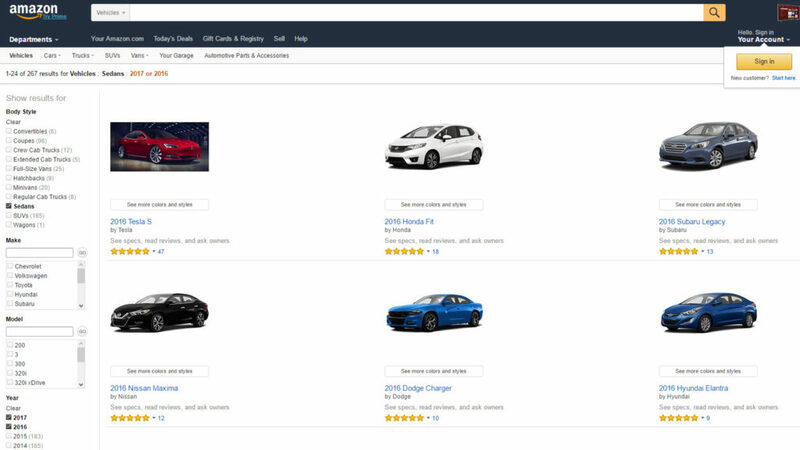 “Our goal is to support customers during one of the most important, research-intensive purchases in their lives by helping them make informed decisions every step of the way,” said Adam Goetsch, director of Automotive at Amazon.com. Amazon Vehicles will operate much like a forum, with customers submitting their own reviews, uploading their images and videos, and also having the opportunity to get in touch with owners of the specific vehicle models. The new page presents its users with an in-depth and easy-to-use platform, enabling them to effortlessly browse through thousands of different car models. The page provides a checklist with an extensive list of options to tick such as the body type, make, model, year, transmission type, overall crash rating and tons more. Once you’ve narrowed down your search you can start clicking through the various motors. When viewing each individual vehicle you will be granted with a few changeable options such as the trim, style and colour of the specific model. One problem I have encountered here is that a lot of the vehicles either still don’t have proper photographic representation or the model presented is not the exact model, but rather the closest depiction of it. That being said, I think this will only be a temporary problem as the images will most certainly updated as the community grows, which will probably be at quite a rapid rate. Beyond this you are provided with more detailed information on key features and specifications such as price, power and performance, safety rating and history of recalls. And then, finally, there will obviously be the customer reviews, probably one of the most defining features due to Amazon’s already thriving online community. Just to give you an idea, according to a press release, Amazon’s already long-time active retail platform for automotive parts sports an impressive 35 million users to date. At present, the company’s new endeavour does not include the actual sale of cars but rather acts as an informative extension of the existing Amazon Automotive store, which allows you to browse and buy various car parts and accessories. When questioned about actual car sales, an Amazon spokesperson told Business Insider: “I can’t speculate on what Amazon would or wouldn’t do in the future”. This is quite a speculative and almost ominous answer.